We spoke to Turkcell’s CEO Kaan Terzioglu at MWC 2019 to discuss how the operator is inspiring loyalty in its home market and sharing its strategy with operators globally via its new DO 1440 initiative. "We are in the fourth year of our transformation journey, from being a regular telecom company which has a 32 minute relationship with the customer to being a digital operator which has 1440 minutes of digital services for the customer – that’s the route of the journey. This has made us the fastest growing telco in the world for three consecutive years, because we are able to provide more to the customer – if you provide higher quality services, they stick to you longer. They are prepared to pay for additional value that you provide. Our theory has become real – so real in fact that we decided to reverse engineer it and create an offer called DO 1440 (Digital Operator 1440, representing the number of digital services we have available) and now we are partnering with other telcos to help them also become digital operators. We’ve announced a partnership with Digicel, which operates in the Caribbean, Central America and the South Pacific, and we’ll be transferring our know-how and digital services and executing them in these markets. We’ve also partnered with Moldcell, who are also taking our digital services portfolio to their customers, as well as ALBtelecom in Albania and CG Corp Global in Nepal. We expect more such announcements this year. Driving loyalty is a major factor in lower income markets – will digital services become the differentiator that allows operators in these regions to retain customers? Absolutely – if data is the new oil, then selling processed data will be like selling refined oil. However, trust will be the new currency – there is a natural element wherein telecom operators are considered trustworthy parties. We did a survey and at least 50% of respondents trusted operators more than other players – this is a very important responsibility. We have to provide the best in class services where we operate. Crucially, I strongly believe that data should stay in the country it belongs. In the last decade, a trillion-dollar digital economy has been created but only a handful of companies have looted this data and they are claiming victory now. The reality is we neglected local markets, local artists, local entrepreneurs and industrialists – it’s time that countries get hold of their data. All these partnerships we’re doing, we don’t touch their data – we don’t want a single gigabyte of another country’s data. If it stays in the country where it belongs, it should create jobs, investments, tax dollars – and I believe our method of being an OTT player is very different from the traditional OTT model, who actually found themselves in a completely uncontrolled, unregulated environment and they really abused it. One more thing to highlight is that what’s called “data privacy” at an individual level becomes “data sovereignty” at national level. We are now moving into the new world of artificial intelligence; even in 4G environments, access to information became very easy, very cheap and very fast. However, we also figured out that it was possible to manipulate people, create fake news, and this resulted in more polarised, more violent, less tolerant societies. The future of telecoms will depend on three revenue streams – credentials management, traffic management, and mobile payments. Any application you put within this triangle will be safe, secure and trustworthy. How should operators go about restoring trust? Our industry is one of the most mature in the world – we’ve had a lot of experience in keeping networks secure and managing credentials. The entire issue about mobile networks is that you have a SIM card, you know your customer, and your customer knows that you know them – there is a sense of personal responsibility in this. If you are creating fake news and distributing it onto specific segments, you’re doing it for a purpose – it’s a scam, a manipulation, a crime. That’s why it’s important that credentials management, together with data sovereignty, are the things that we have to define. As telecoms operators we are best positioned to commit to keeping high standards in this area – that’s why we have made a digital declaration together with the GSMA clearly stating our point of view and describing what we’ll commit to. You spoke out in defence of Huawei with regard to the security concerns they face in the US. You noted that the US has presented no evidence against Huawei and that your experiences with the vendor have been positive. Do you think that security needs to be ensured before trust can be restored? I defended our industry – it’s not an industry in which it’s OK to have a security problem. We do our job well, we secure our networks and our countries and customers. We’re a mature industry, we’ve been doing this for over 100 years. It is our responsibility to keep our networks safe. Turkcell works with many vendors and we are extremely sceptical when it comes to security, so all the vendors receive tough scrutiny on security issues. I think it is disrespectful to our industry that such a thing is made as a warning; if such a thing is to be made, there are many other industries that do not have the same stringent qualities. I’m more worried about problems like Cambridge Analytica – I think that should be discussed, not a vendor from one country. All vendors worldwide, I see them as equally trustworthy or otherwise – it’s not a selection based on the country. There is a job that needs to be done by us; we always work with multiple vendors, there’s not telecom company in the world that works with only one vendor. In the wake of 5G, telecom companies will be looking for the best technology at the best prices, and there are a handful of companies which can provide these technologies at scale. The way to do it is to focus on the customer and prove that you’re a better technology provider. Our doors are open to all countries that can do this. How do you think it’s possible to implement accountability in terms of social media companies using customer data? We are a very well-regulated industry, but beyond that we take reputation so importantly that no telecom company will be losing their dignity by selling people’s data. These are our customers; they trust us with their identities, and this is something that will only be impacted by court order. If a judge orders it, we can share information. I would advise every single country to demand data sovereignty; this does not mean closing doors, but on the contrary they can embrace all technology companies and ask them to bring their data into the country – but there need to be rules. We launched 4G two and a half years ago, and when we launched 4G we used a technology platform which could do carrier aggregation. Today, we’re capable of delivering 5G-level services based on the standards and the spectrum that we have, so it’s not an issue in terms of technological capabilities. 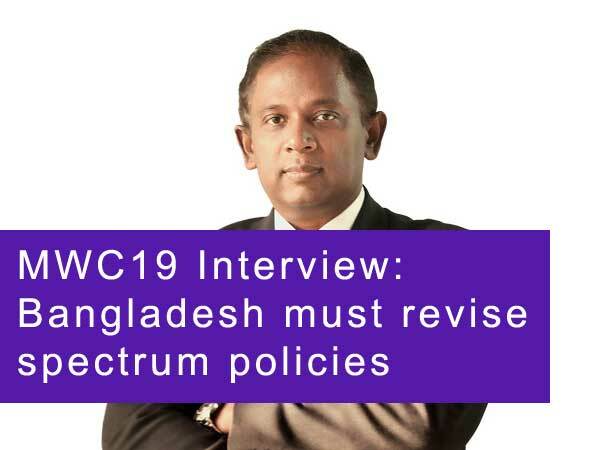 I think this time round, the governments will not go through tendering processes and pre-tax the industry, but instead allocate spectrum in exchange for commitments of investment. This will be the successful approach; what is key in 5G is that artificial intelligence will be operationalised, because 5G offers almost zero latency. This means that AI can be enacted across different industries. People ask me what will be the killer app of 5G – how about 7 billion people talking different languages with real-time translation and perfect lip-synching? A Star Trek-style universal translator will remove the natural advantage of America, the UK and India. The rules of the game will be different in the next ten years. Germany and Japan succeeded through standardisation, methodology, and focusing on the details – maybe AI could do that. Maybe countries like Italy and Turkey, which are focused on creativity and entrepreneurship, could use these new AI chips to compete.